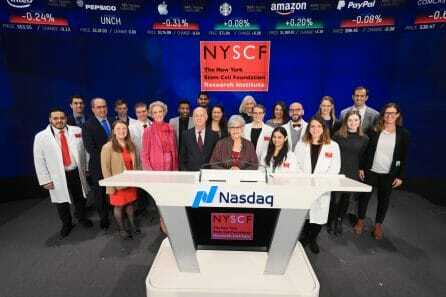 This morning, NYSCF CEO Susan L. Solomon rang the NASDAQ bell to officially open stock trading for the day. Ms. Solomon was then joined by NYSCF staff, scientists, and board members for the official bell ringing and opening of the markets. 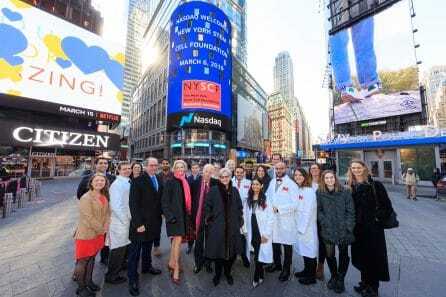 The ceremony, along with a video outlining NYSCF’s mission of accelerating treatments and cures for the most devastating diseases of our time, was projected on NASDAQ tower in Times Square, a seven-story screen seen by thousands of New Yorkers each day. Footage of the event was also broadcast on CNBC, Fox, Bloomberg News Network, and Bloomberg TV. Susan Solomon and NYSCF staff, scientists, and board members gather outside the NASDAQ MarketSite in Times Square. Representatives from NYSCF at the bell ringing ceremony.